The other day breaking into my new denim. It’s always a struggle getting into them at first (I know we’ve all been there! lol. ), but they’ll fit perfectly as they loosen up over time. The Canadian Tuxedo is one of my favourite looks to wear, there’s an easiness about it which I love. Speaking of easy, I’m on the hunt for the perfect pair of easy boyfriend fit jeans, and although skinny’s are my go to fit, I’m thinking of loosening up this summer. I remember I had a pair some time ago, but chucked them to the back of my wardrobe (thought they look odd on my shape), but if I can find another pair that sits well, I’ll be a happy bunny. and if you weren’t able to get your hands on them, now’s your chance. Great look! Very easy like you said. Less is definitely more. looking very good denim is always best for all man and women kind i use always denim brand. Love the denim uniform too. Can easily take it from super cool with trainers to super fly with a pair of heels and a blazer. Love this look!! So comfortable yet so chic! It’s such a nice combination, I have the exact look on my blog too , denim on denim with ripped knee. I love how the shades of blue are different, would have looked like a jumpsuit from afar if it was the exact same shade from top to bottom. You look great as always Shirley. I love how your style always comes through, no matter what you’re wearing – simple and classic! Love this look! Definitely check out Topshop again – they have great jeans for all fits, and i’m pretty sure they carry a nice boyfriend jean. Otherwise go for a pair of classic Levi’s 501s… those are great boyfriend jeans too good luck!!! Love me a Canadian tux, definitely a must in my wardrobe. 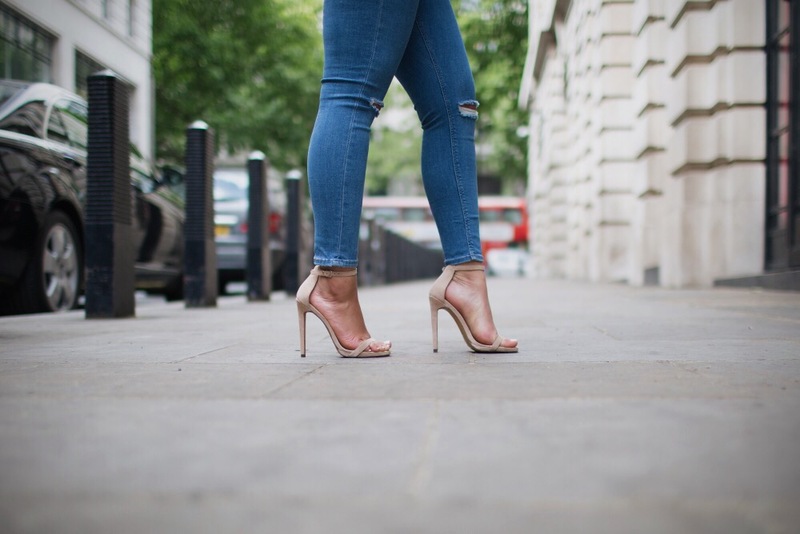 How do you find you’re size in Topshop jeans? I don’t really understand the sizing and I want to get this pair. Great look! Love the casual simplicity of the look. I’ve got a pair of boyfriend jeans from levis and they’re great. Not too baggy just the right fit! Citizens of humanity has awesome boyfriend jeans. 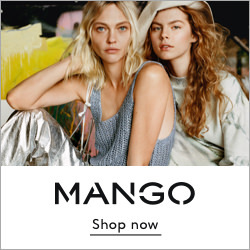 Shopbop has few on sell right now. We’re shaped similar and wear the same size. I’ve found their the only jeans that fit me well and I’ve tried countless brands. Pricey but worth it. you. It’s always so hard to get the perfect jeans. I love your outfit shirley!!! Your style is always so effortless, yet put together. I live in Canada and have yet to try the “Canadian Tuxedo”, I might have to give it a go. Denim on denim has become one of my go to looks because it’s always so easy to dress up or down. Love your fitted ripped denim pants. Also, try Express for boyfriend fit jeans. I bought some from there not too long ago & I absolutely LOVE them! Denim x Denim one of my absolute favorite looks. Shirley SLAYSS once more, inlove with this all denim number , especially for the pending summer time! Shirley, you’re style is amazing, I really love everything you do! You even know how to rock denim on denim yes! Getting a glimpse of London is always swell. I haven’t done a denim on denim yet, hopefully it will be trending in fall again. It’s too hot to wear it now in Abu Dhabi. I’d melt or combust for certain. I love a little double denim, I’m currently into mixing my denim colours when rocking the Canadian tuxedo arm (might defeat the point though haha) . I’m really impressed with the fit of Asos own brand jeans. I’ve always struggled with finding mom and boyfriend jeans that fit me as I find that most a cut to fit someone with a straighter shape but ASOS seems to fully understand that women have hips, bums and thighs. I’d definitely check them out! Denim on denim is always a classic. 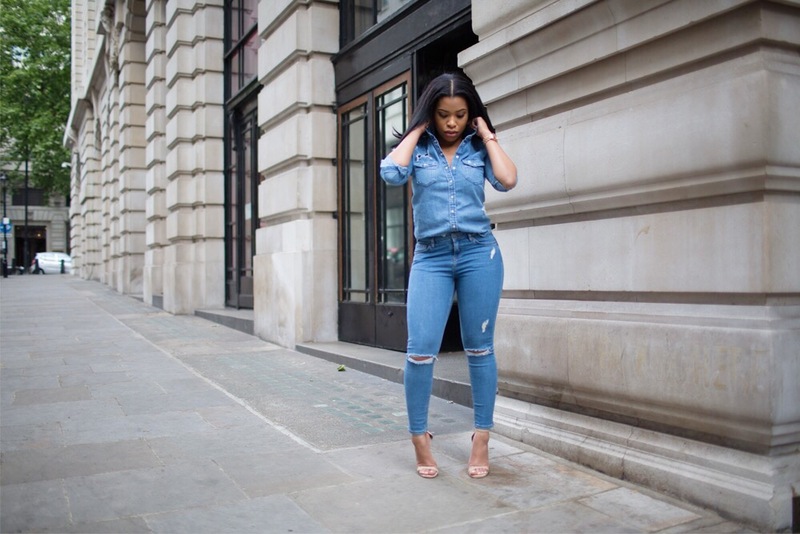 Check out my denim on denim collaboration here. Even a casual denim outfits looks so chic on you, Shirley. LOL! Loving the denim on denim look. I absolutely adore denim x denim! The Canadian Tuxedo is a favorite of ours as well. We see that for skinnies we should try a pair from TopShop as the knee rip detail is everything. We recommend for boyfriend jeans Old Navy’s “the Boyfriend’s” They come in different washes and details. Dope Miss Shirley. I love this dress and it amazing when you double tap the dress from head to toe. Gorgeous is your middle name. I admire you so much and take you as that big sister I never had to look up to as my role model but there you are I don’t even know you personally but you give me hope and joy when every I look at you video and pictures. And that other video about body image give me so much to live and love my body no matter what or how I look. Thanks for being that my role model and a big sister to me. Wish I get to met you one day because you are my birthday month partner. I too am on the hunt for the perfect pair of boyfriend jeans. Being as I am very slim, I can’t seem to find any that actually fit my waist! Yes, recommendations will be very much appreciated. I also posted a denim on denim look on my blog and YouTube channel, but I left the top open a bit and threw on a bralette underneath. Lovely! In all honesty, I have tried to wear this outfit so many times but it never looks this good on me. Your body is seriously everything. Oh my I love the way you pull off this look, amazing! I love the outfit its very simple but classy at the same time.